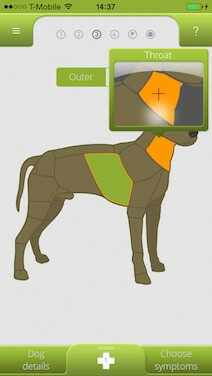 Select the affected body part using the intuitive DoggyDoc touch-interface. 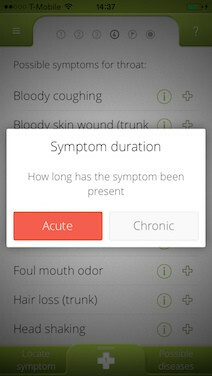 Select the symptoms you observed from a list of possible symptoms. Our artificial intelligence based virtual diagnosis system calculates possible diseases and displays them ordered by probability. Get detailed information on the diseases cause, course, therapy and emergency measures. 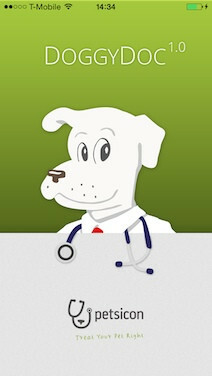 DoggyDoc is your first stop when you suspect that your dog has health problems. DoggyDoc is always there for your dog - wherever you are, 24/7. Developed by artificial intelligence experts.in cooperation with experienced veterinarians. 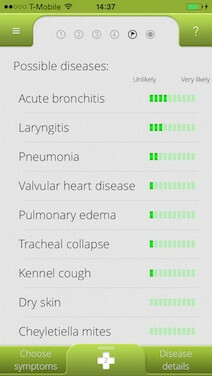 The fastest way to get information on your dog's health. Includes comprehensive, easy-to-understand explanations of all canine diseases. Stop searching the internet for hours - find all the information you need at DoggyDoc. Improve the accuracy of the diagnosis by entering more symptoms. 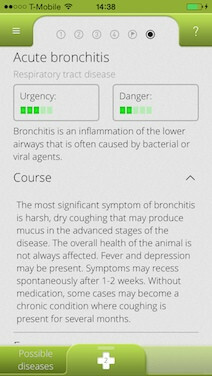 DoggyDoc helps you recognize your dog's diseases and take appropriate steps.